Match mailing is the process of producing and inserting multiple personalized pieces into a single mail package. Receiving a personalized mail package is becoming more and more popular, because companies have learned that when targeted directly and personally, an individual is more apt to respond to the campaign being promoted. How does does mail matching work? The personalized pieces are printed with a small 2D barcode, which measures approximately 3/16″ x 3/16″. These barcodes can be read by adjustable cameras, or “eyes”, that are positioned on the inserter (like Valtim’s Flowmaster). When the barcode is read, it prompts the inkjetter to pull the correct name and address from the data base, and print it on the carrier envelope. This is referred to as “read and print” technology. Valtim’s Flowmaster has 2 cameras, which allows for 2 personalized pieces , plus the addressed carrier, resulting in a 3 way match mailing that can be done in one pass. These uniquely personalized mail packages can contain up to 9 pieces to entice, motivate, captivate, or stimulate your targeted audience. Insertion in the order that you desire is achieved by loading the pieces into the corresponding trays to ensure the correct order. Let Valtim increase your response rate by combining our variable imaging printing with our read and print technology. Together, we are sure to wow your prospects. Is Mail Matching Right For Me? Match up to three personalized items into a single envelope using our high speed mail matching system. Additionally we can affix personalized member cards, key-fobs, and other personalized tokens for even greater matching power! Our twin camera matching system allows us to match personalized packages at a rate of over 22,000 pieces per hour! Making unique and personal packages a reality for your organization. 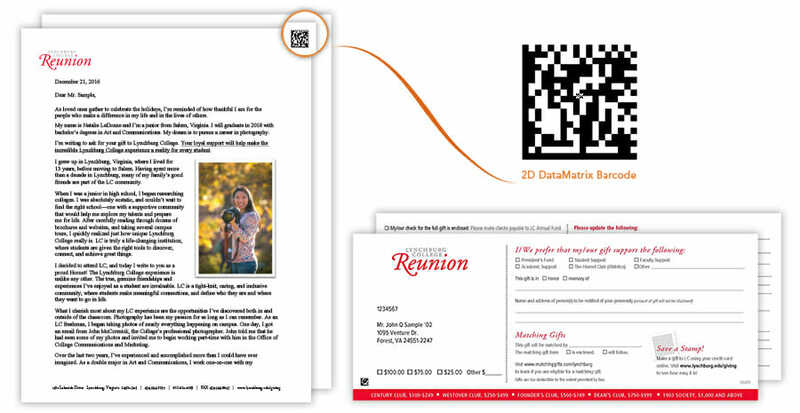 With the ability to both embed and read large amounts of information from the 2D barcode you can be assured the highest level of mail matching accuracy. A fully automated process provides not only an efficient process, but also reduces wear-and-tear on the mail package before it goes out. Making your mailer look pristine when it arrives in the mailbox of your customer / member / lead.